Tap date text to cycle colors. Tap Time text to cycle time modes - 12 hour, 24 hour, Chronograph, UTC, Extra TZ 1, 2, 3 and Compass. In Chronograph mode tap phone battery display to start/stop and watched battery display to reset. Tap Sun/Moon display to cycle to fitness display. Tap Weather display to cycle modes. Tap Center to cycle dim modes, On Normal, Always On and Off. 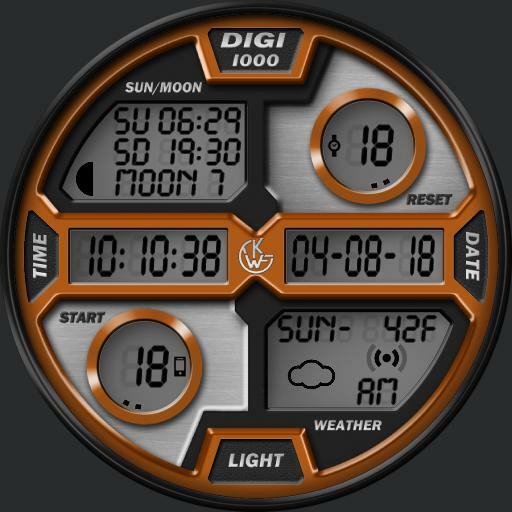 This face utilizes UColor for the lume color of the displays on dim.